If you’re having trouble with your Square Stand, the following tips will help you get back to accepting payments quickly. Be sure both your Apple iOS and Square app are up to date. Note: If you are using an iPad in your Square Stand, ensure your device software is updated iOS 11.2. We are aware of an issue that disrupts the connection between Square Stand on earlier versions of iOS 11 and worked with Apple to resolve this. You can mount your Square Stand using an adhesive mount or drill mount. For mounting instructions, visit Mount and Secure Your Square Stand. Make sure you’re processing an accepted card and that you’re swiping the card smoothly through the reader track. You can also try troubleshooting the reader for Contactless and Chip. Keep in mind transactions must be at least $1.00. Try swiping a different card. If the Square Stand successfully processes other cards, encourage your customer to contact their card-issuing bank. Force quit the Square app, then re-open the app. Uninstall the Square app from your iPad and reinstall. See Apple’s support site for instructions on how to do so. Note: Before uninstalling, make sure you’ve uploaded any payments accepted while in Offline Mode, or you’ll lose those uncompleted payments. Check that the Square Stand and the iPad are properly connected. Make sure the Square Stand is plugged into the accessories hub and that the power adaptor is plugged into a grounded AC outlet. Gently unplug and firmly replug in the power adaptor. Try plugging the power adaptor into a different outlet. Remove the iPad from the Square Stand. To do so, remove the security screw or pin, then press the eject button located on the underside of the iPad enclosure. Update your iPad to the latest version of iOS and the Square app. 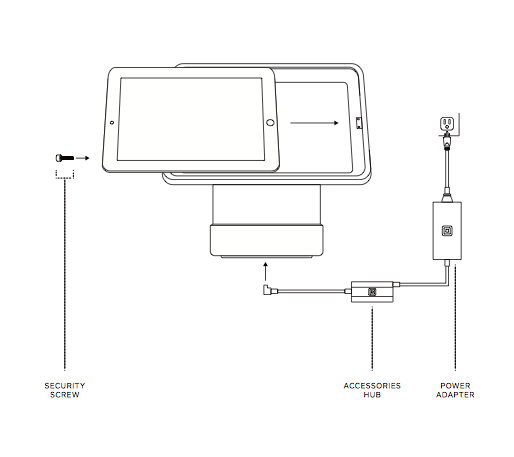 Push down on the Square Stand connector one time, and then re-insert the iPad into the Square Stand. Update your iPad to the latest version of Apple iOS and the Square app. Force quit the Square app and re-open it. Make sure the Square app recognizes the stand. To do so, visit your in-app Settings. If Square Stand is listed, it’s connected. Confirm your iPad recognizes the stand. To do so, press the home button on your iPad. Tap Settings > General > About. Square Stand will be listed if it’s recognized. If you don’t see Square Stand listed, unplug the stand from its power source, remove the iPad from the stand, and plug everything back in. If you’re unable to remove the security screw or pin, contact us. Make sure the Square Stand is firmly plugged into the accessories hub, and that the hub is plugged into a power adaptor. The power adaptor should then be plugged into a three-pronged outlet. Ensure that you’re using supported hardware. If you’re attempting to connect an unsupported device, it won’t be recognized by the Square app. Check the USB connections of your hardware. Unplug these devices from the accessories hub and plug them back in. Note: If you’re using non-USB hardware, try these troubleshooting tips. For minor scuffs and marks, use the cleaning cloth included with your Square Stand. 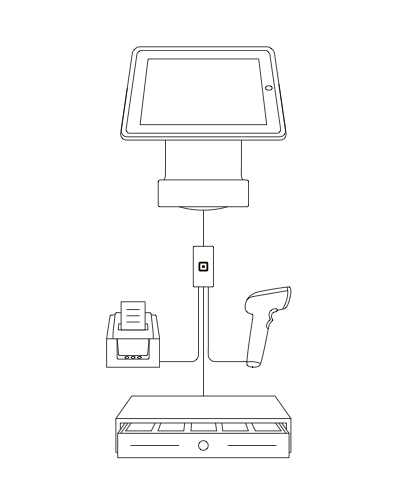 To clean the reader track on Square Stand, you can use card reader cleaning cards or a folded paper towel. Slide the cleaning card or paper towel through the card reader slot to clear any spills or debris. If you’re still having trouble with your Square Stand, you can submit a warranty claim or return the unit.